Tonight sees Birmingham City take on CD Nacional at the Estádio da Madeira, in the first leg of the Europa League playoff round tie. Our opponents had somewhat of a better league finish than us last season, managing to finish sixth in the Liga ZON Sagres , a point ahead of Paços de Ferreira which entitled them to a place in the Europa League second qualifying round. Nacional have reached the playoff round after beating Fimleikafélag Hafnarfjarðar of Iceland 3-1 on aggregate in the 2nd round, and then BK Hacken 4-2 in the third qualifying round. The instantly most notable thing is that Nacional failed to beat either team away; indeed, they lost 2-1 to Hacken. They have played one league game currently, which they drew 0-0 with Feirense away. There is a video of the highlights of that game here. @Cahiers_dusport, who I follow on twitter gave updates on the game and one of the biggest things I took away from it was that Nacional were toothless in attack. When I asked him what he thought Blues’ chances were in Madeira, he said he thought it would come down to a single goal – basically keep it tight, frustrate their fans and nick it. Blues took a twenty man squad to Madeira, with Jordon Mutch joining Marlon King, Cameron Jerome and Nikola Zigic in the treatment room. As the Europa League allows for seven on the bench, it would appear only two of the players taken out there will miss out – I’m suspecting Hubbins and Jervis, and it shows the fragility of the squad in my opinion that we only have twenty players by including some real academy rookies. There have been hints at changes; it’s possible Scott Dann may come in for his season’s bow at centre back; Nathan Redmond is a possible to come in on either side, particularly as Chris Burke looked like he picked up a knock at the end of the Coventry City game and with Jordon Mutch out it may well be that Blues go for a flat 4-4-2 pairing Adam Rooney and Chris Wood up front. As you may well know, Blues don’t really have any pedigree in Europe – but don’t believe what the Daily Mail tell you – we have won four times away in Europe – against a Zagreb XI, Union St Gilloise, Ujpest Dosza and most famously against Internazionale in the San Siro – being the only English team in forty years to win at the famous ground. The game is being broadcast on FM and DAB by BRMB radio; there will no doubt be internet streams of it but please don’t ask me for a link because I don’t really want to advertise what is a legal grey area. This is what I’ve been looking forwards to since the moment Mike Dean blew the whistle at Wembley. Today, we’re in Europe. Let’s hope our adventure doesn’t end as soon as it’s begun. I can’t see Dann getting off the bench as it makes him cup-tied him in the event that Stoke or even Arsenal come back in for him before the end of the transfer window. I also expect us to play 4-5-1 / 4-3-3 with probably Wood starting up top. It’s still great to be there though! Cup tie inelligibility rules cover European club competitions, not the Europa League and Champions League seperately. 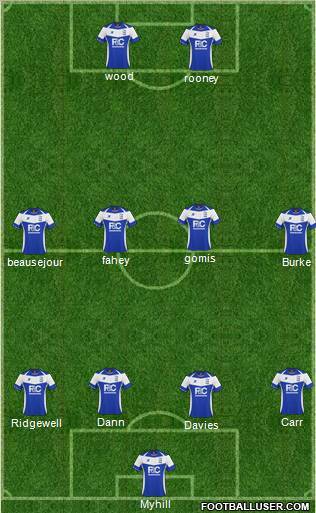 @meefee – with Mutch out, I think he’ll go 4411 with Spector in the middle, Fahey on the left and Dave in behind Rooney. Of course i want us to win (or at least not lose), but I can’t help but feel that with a squad as small as ours, the European “adventure” is a trip too far. I certainly wouldn’t swap a Europa campaign of any length for relegation to the 1st. Everyone is talking of Dave? who is this? It’s an internet thing, they mean Beausejour. I think Relegation is a step far; We should finish between 4th and 8th this season – we have good players even without the ‘top players’ that are touted for sale. We should do well; I expect to lose 1-0 tonight; but am going to bet £1.50 on us to win 1-0 and Dann to score for a return of £400. If he doesn’t play I get my money back. Anything more is a bonus – just pray for no extra time and if we get an away goal – then even better still. KRO and See you there!! I hope blues have a really good go and attempt to win the match tonight.